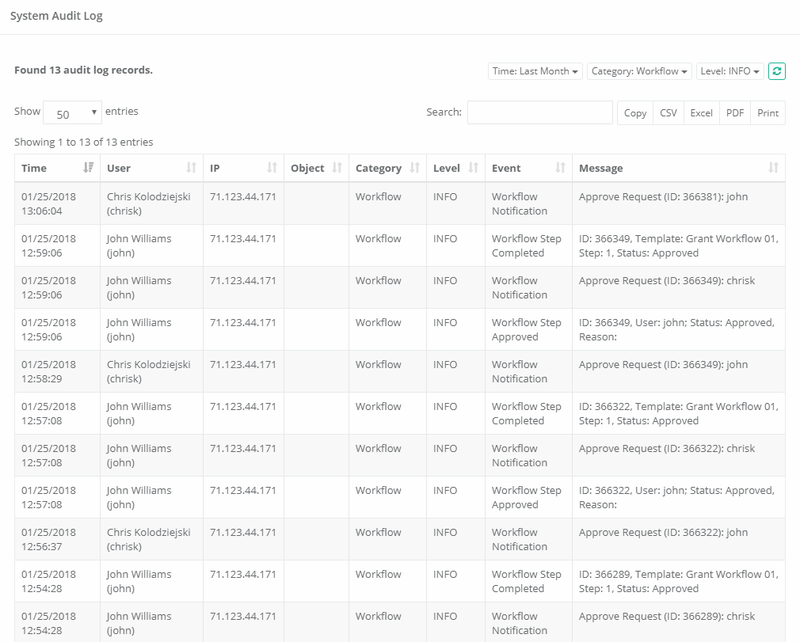 The Audit Log provides a report of audit events captured throughout the XTAM solution by all users and activities. Filtering is available for Time, Category and Level options. Time: Displays the timestamp (MM/DD/YYYY HH:MM:SS) of the recorded event. User: Displays the account that performed the recorded event. The account pamservice is used by the XTAM system for performing background or scheduled tasks. This is not a user account. IP: Displays the detected IP address of the user that performed the recorded event. Object: Displays the name and provides a link to the object (record or folder) that is associated to the recorded event. Category: Displays the category (used to organize events based on relationship) of the recorded event. Level: Displays the level of the recorded event. Level includes INFO, WARNING and ERROR. Event: Displays the type of the recorded event. Type includes examples like Edit, Create, Connection, Update Queue Records and more. Message: Displays any system messages associated to the recorded event.